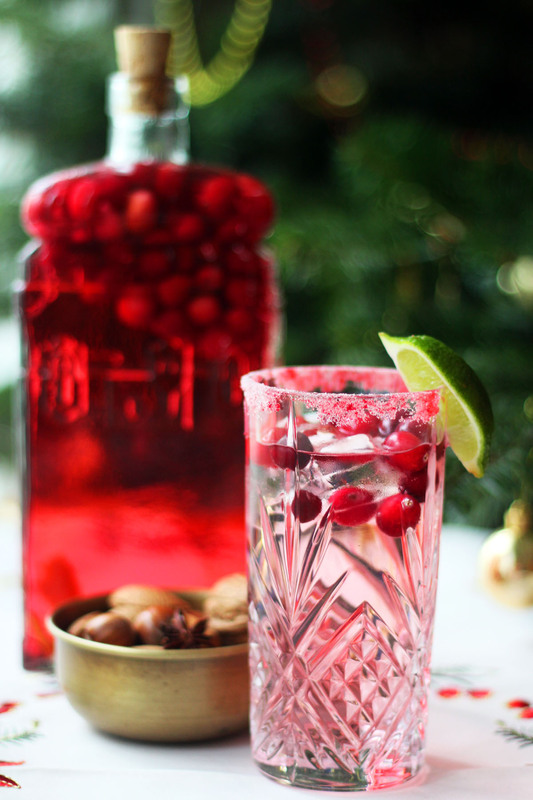 Give your gin & tonic a festive twist with cranberry and lime. Don’t forget to dust the glasses with some sparkly sugar for an extra festive touch! 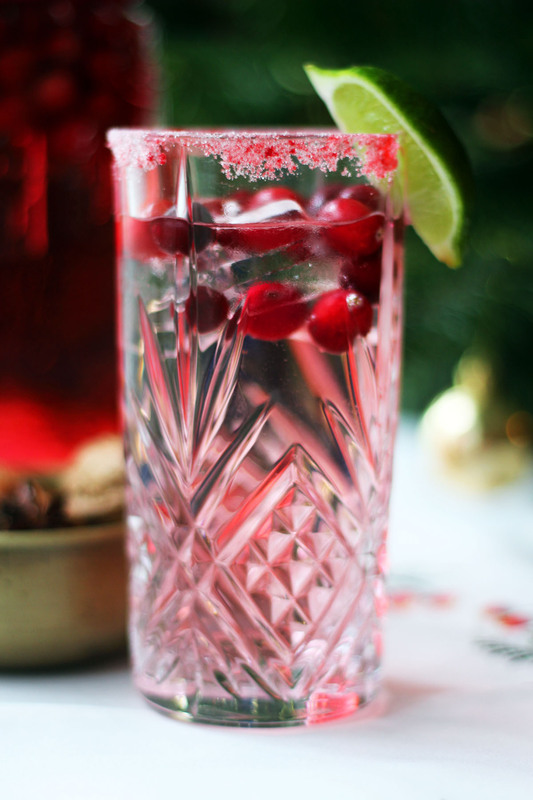 Read on for my Cranberry Gin and Tonic recipe. It’s no secret that my tipple of choice is gin so when I get back from a long, hard day Christmas shopping the first thing I do is pour myself a gin & tonic. Each year I underestimate just how tough it is, spending a whole day pounding the pavement and waiting in queues on our Christmas shopping day – it is really intense! When we get home it’s all about putting our feet up and relaxing, and this Cranberry Gin and Tonic recipe helps me do just that. This year I did most of my Christmas shopping online. In fact I think I do more and more online shopping each year. That being said, I still look forward to the annual Christmas shopping trip with Jon. Whether we take a tour round Oxford Street, head to Brent Cross or even Milton Keynes, it’s nice to spend a whole day wrapped up in Christmas with my favourite person. This year I found myself in Germany visiting the Christmas markets in Frankfurt and Heidelberg. I spent loads on gifts for friends and family not to mention cookies, stollen and more for Jon and I. Whilst the trip was well worth it, when I finally got back in the UK at the end of the weekend I was absolutely knackered. Talk about covering miles when Christmas shopping! Luckily for me, when I finally arrived home I was greeted by a Gin & Tonic. Heaven! Ideally this Cranberry Gin and Tonic is made with a cranberry infused gin – I make my own each Christmas (see here) but you can always use a splash or two of cranberry juice and regular gin if you haven’t got time to infuse your own. As well as the cranberry infused gin, I think it’s fun to serve these drinks with cranberry spiked ice cubes. They are easily made by placing a few fresh cranberries in an ice cube tray before adding the water. These can be made the morning before you go Christmas shopping or days if not weeks in advance! Why not put a couple of trays in now so you always have them ready for a spontaneous Cranberry Gin and Tonic? The morning before you go shopping, place a couple of fresh cranberries into an ice cube tray, fill up with water and pop in the freezer. That evening, pour the caster sugar on to a side plate, add a tiny drop of red food colouring and stir until the sugar turns red. Dip your finger in water and run it around the rim of your glass. Dip the slightly damp rim into the red sugar to create a tinsel effect on the glass. Pour the cranberry gin into the glass then top up with the tonic water. 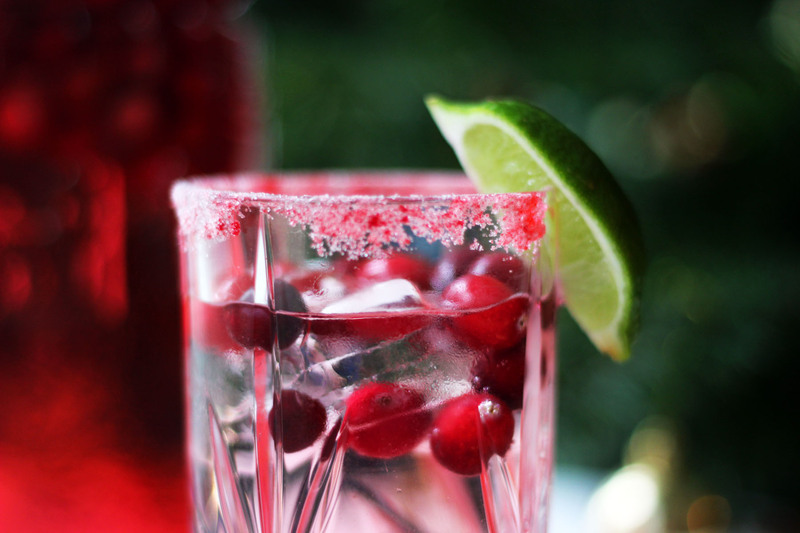 Add one or two of the cranberry ice cubes and garnish with a wedge of lime. So there we have it, a festive Cranberry Gin and Tonic with tinsel trimmed glasses and a wedge of lime. It doesn’t get better than this. Do you prefer to do your Christmas shopping on the high street or do you mainly shop online like I do? If I get given this Cranberry Gin & Tonic every time I go Christmas shopping I might do more of it on the high street next year! This is just the most perfect Christmas cocktail! It looks so good and I bet it tastes so refreshing. YUM! Thanks Kate! It slips down incredibly easy as its so fresh and zingy 🙂 a must have this Christmas! I love gin! Definitely my tipple of choice too and love the idea of using cranberry infused gin too, very festive and clever indeed! This is what I was planning to make for my Christmas party this week! Although I haven’t infused anything so it will be a splash of cranberry juice for me! Thanks for the tip about the ice cubes though – I’m going to do it! Great minds think alike Kerry! The cranberry ice cubes are an extra bit of flair! Thanks Camilla! The bright red of the cranberry and flash of green from the wedge of lime do lure you in!